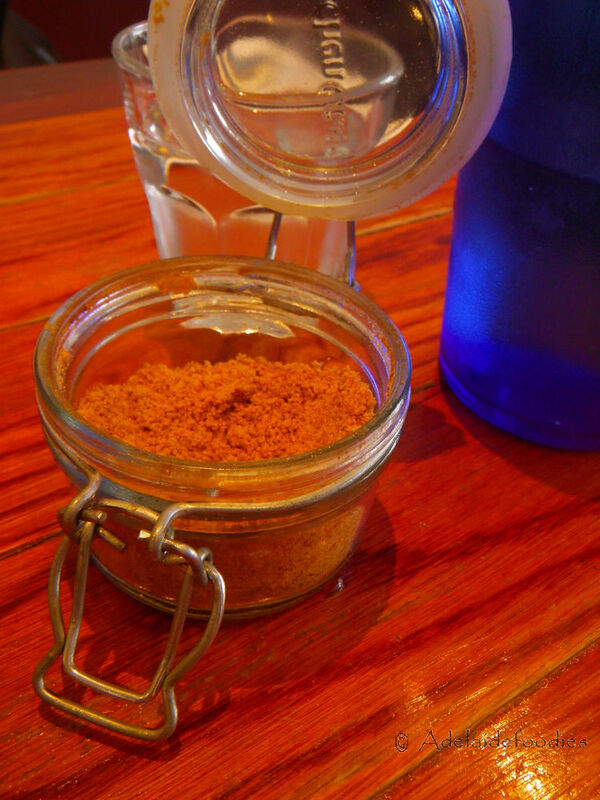 When talking about restaurants/cafes serving genuine and delicious organic food, which one first come up in your mind? For me, doof-doof was the catch. 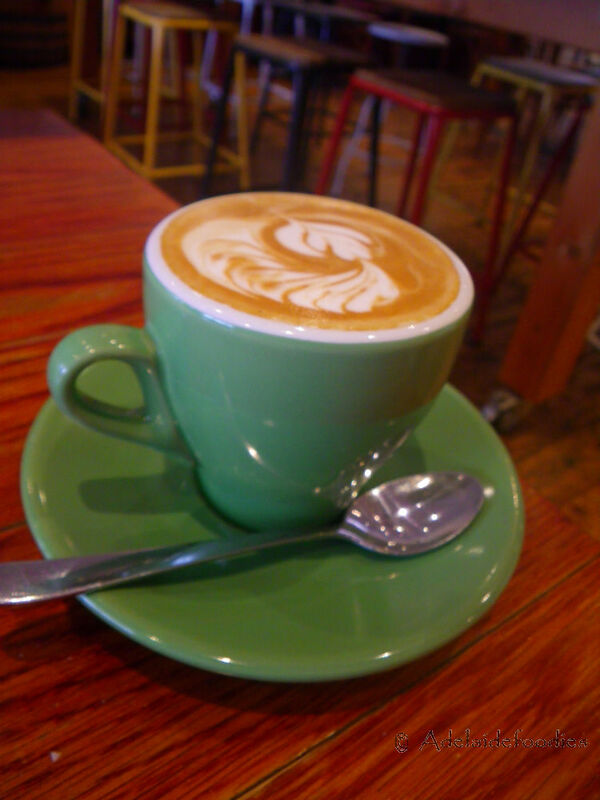 When I worked in Urrbrae couple of years back, we used to go to doof-doof on Duthy street regularly for lunch. I still remember the joy of dining on delicious dishes while observing the local organic produce around. However, further down the track, with the change in management and so on, the doof-doof became a place many people wanted to avoid due to the fact that they were not organic and were not as delicious as before. After moving away from the previous job for two years, excitingly, when bypassing the place in April, I found there was a name change from “doof-doof” to “Nature’s Providore”. Curiosity has driven me thinking that we needed to find a time to check this place out. Magically, an email invitation from the Nature’s Providore management came into my inbox at the same time. Packing up and going to the restaurant was my first action, so on a cloudy rainy cool Sunday, Tina and I went straight from home to the new Nature’s Providore. 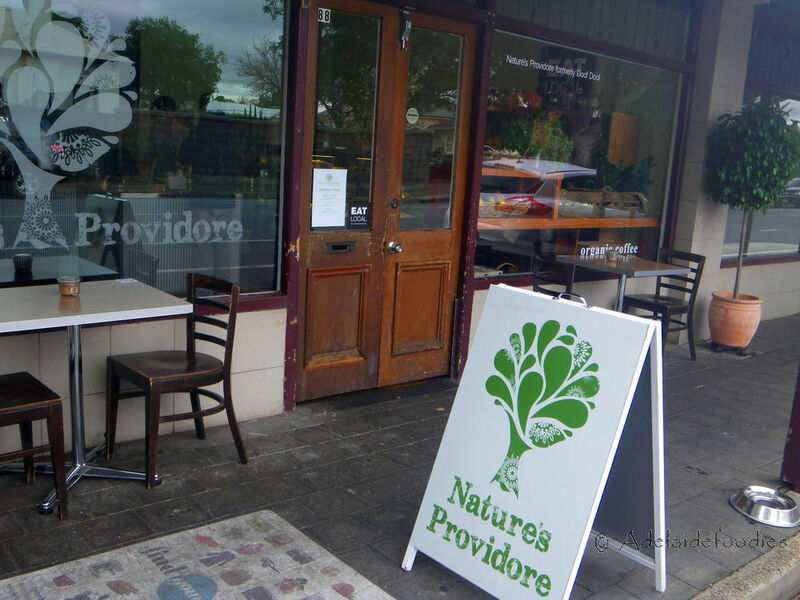 Nature’s Providore is located on the quite Duthy street before Cross Rd, surrounded with beautiful houses and landscapes. 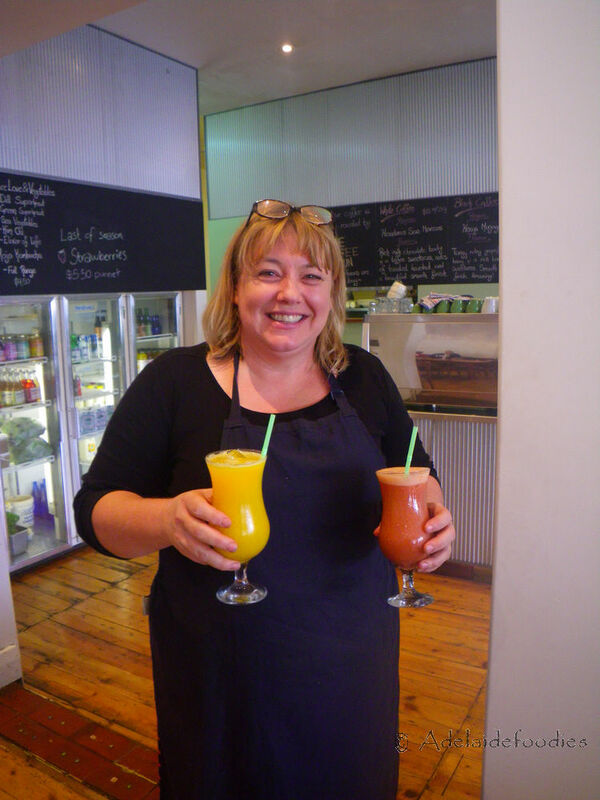 The cafe is owned and operated by a local South Australian resident, Kate, whose smile and welcoming has become an image of the cafe among local diners. Aiming to get the place back on track with organic food, Kate did everything possible during the last year or so to source the ingredients from local certified organic growers where possible. Being certified means the produce can be tracked down from the very beginning of their life cycle and every step has to be well monitored to make sure they are organic. 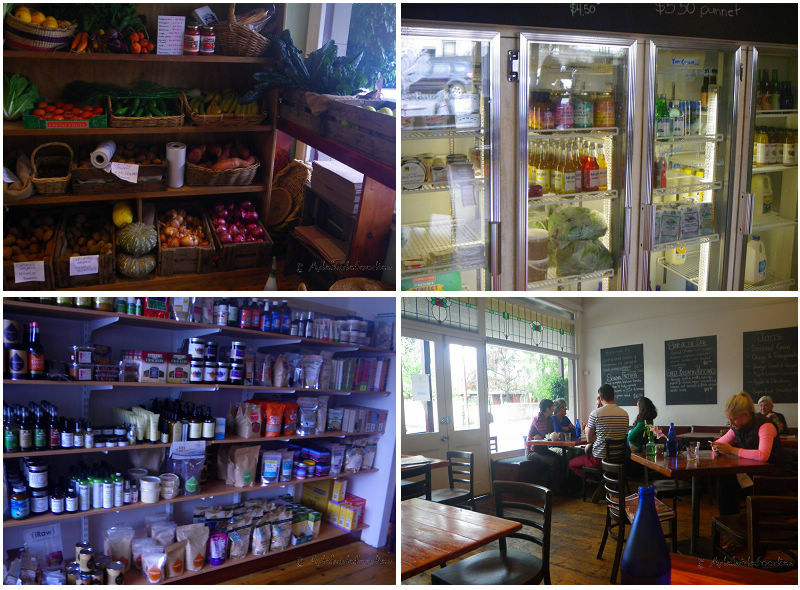 Nature’s Providore has now become one of the few Adelaide cafes, specialising in organic whole foods. Many people doesn’t get the idea of human consumption of organically produced food. You can read one of my previous interviews to learn more. When we walked into the cafe, lots of fresh organic fruit and veggies were on one side and food products made from organic whole foods on the opposite side. Nature’s Providore is a member of Eat Local SA and I know I am definitely having my food from South Australia so than the freshness is assured. The minute we entered the restaurant, my memory of the last two years flashed back. However, a good sign was that the place was almost full and was filled with conversations, laughs and nice food aroma. 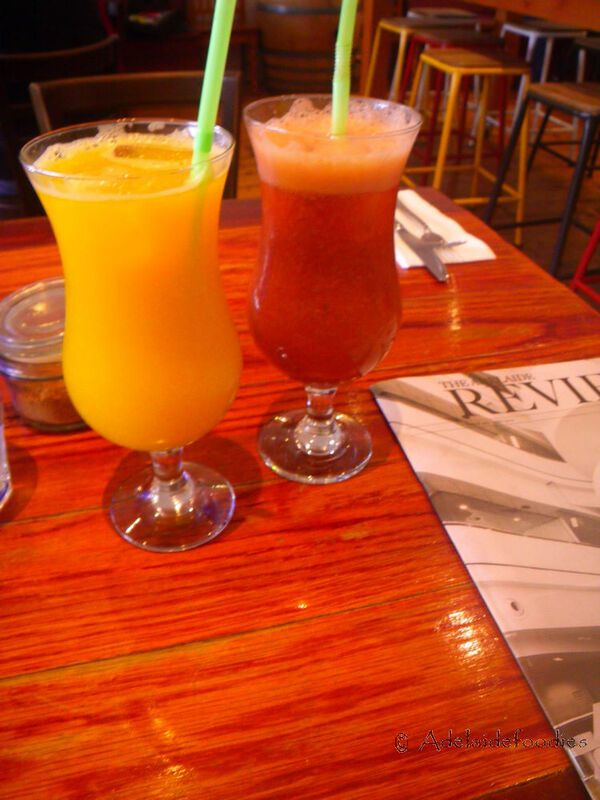 After being seated, we ordered an organic orange juice and a strawberry and apple juice. These two juices, as indicated previously, are made from 100% organic produce and kick-started my day really well. Tasty and refreshing, especially the strawberry and apple juice! 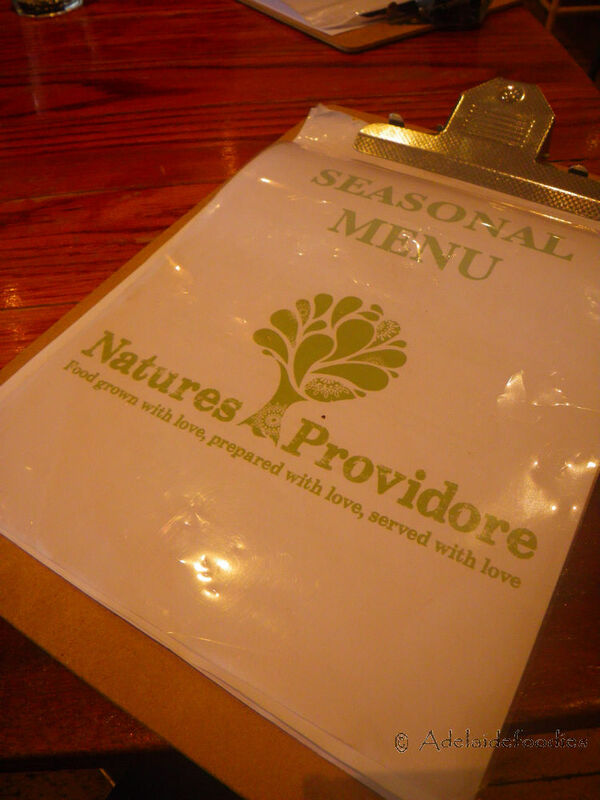 The seasonal menu of Nature’s Providore features a broad range of breakfast and lunch dishes. On Sunday, like many other cafes, they offer full day breakfast. The listed prices on the menu are quite affordable and works out better with all the organic produce that diners would experience. For what to order, I left the question to the waiters. I always trust my waiters somehow and let them give us several options because they definitely know more about their own food. Then, it’s easier to decide from the small selection, isn’t it? For me, I ordered the seasonal breakfast with San Jose chorizo. 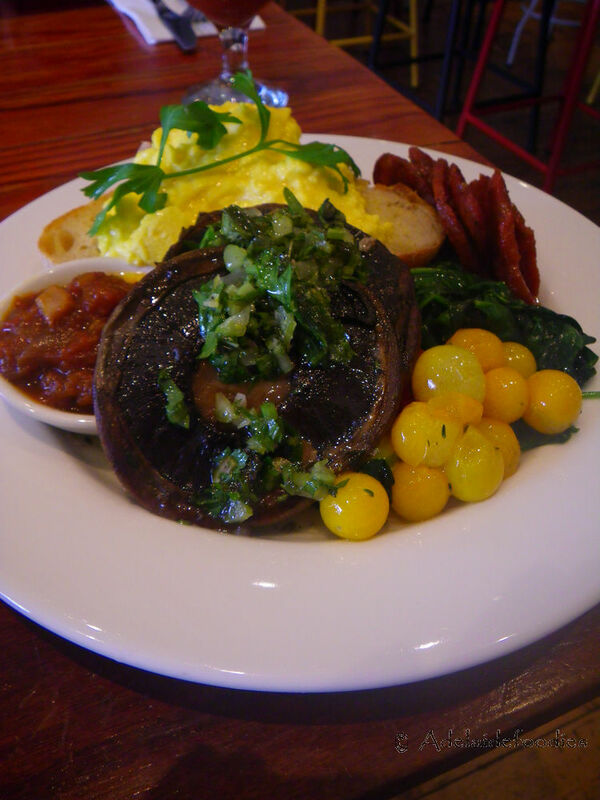 McGwerriton organic eggs scrambled, oven roasted tomato, sauteed baby spinach, oven roasted field mushroom with salsa verde, seasonal relish and toasted organic Mylor white sourdough with Paris Creek organic whipped butter. From the above list, one may have already known the health aspect of this dish. Many people say healthy stuffs are not so tasty but is this true? Not with Nature’s Providore though. The food was very very DELICIOUS! The oven roasted flavours have fully gone into the mushrooms and the tomato. With different taste approach on the palate, the two produce magically worked together extremely well. Throughout my dining journey, freshness was the dominating factor in this dish. There obviously was no oiliness but once entering the mouth, the ingredients promoted each other’s flavour so well and with the smooth texture of the scrambled eggs and the chef’s culinary skills, taste sensation and texture become two good friends. 😀 Well done and highly recommended! Tina has almost become a vegetarian these days so she ordered the famous veggie burger. 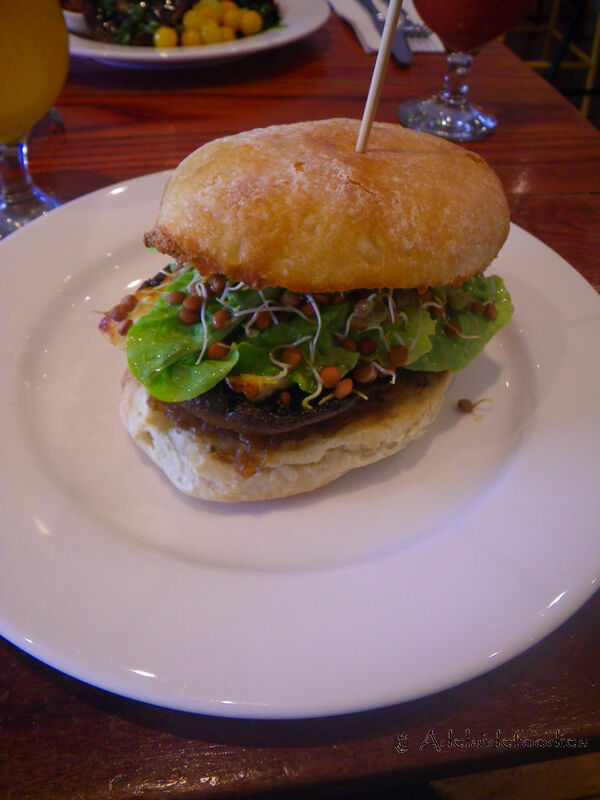 This is one of the best veggie burger that I’ve tasted. The sheep milk haloumi did not exhibit a high level of gameness and this decent clean flavour enhanced other produce’s combined taste. The organic chilli onion jam was not hot and hence complemented the mushroom very well, providing added complexity on the palate yet still very refreshing. The sprouted lentils was slightly bitter but with the rest of the ingredients, the bitterness and the acidity from the lemon aioli balanced each other very well and hence overall the dish was very yummy. Looks like the cafe knows how to play around with their flavours :). Recommended! Our dining trip did not end here. I ordered an organic coffee but Kate mentioned that their sugars. All sugars used in Nature’s Providore are palm sugars not refined sugars and hence it can minimise the risk for people with diabetes. Overall, the dining experience at Nature’s Providore was very enjoyable and it was always great to talk to local business owners to see some great people doing great stuffs in out state. I would definitely recommend you to try their mushroom dishes. Hey, remember July is the month for mushroom lovers – mushroom mania 2014 is coming :D. Why not drop at Nature’s Providore for a mushroom themed healthy and tasty lunch on Sunday? Next coming on Adelaidefoodies is the wrap-up post for World Aquaculture Conference Adelaide 2014. Stay tuned as lots of info are coming your way. Enjoy! [Disclaimer] We are guests of the cafe and the food was provided but all opinions are our own. We use to love the doof doof but have not been at the restaurant since moving to the hills. Must go to try them one day. Surely, you need to try them to believe me. Do you like mushrooms? I am not a big fan. Whenever people say mushrooms taste like meat, I feel upset. They are fungi not meat! You made a valid point here. The food quality and taste now are definitely better than the old doof-doof. I know. Since the changeover of ownership at doof doof, the food quality went down dramatically. It’s really glad to see Nature’s Providor has taken the place back on track with organic produce. It tastes better than its appearance!